The centerpiece of this gorgeous kitchen, designed by Lisa Cohen and located in Alpine, New Jersey, is the chic copper farmhouse sink. The intricate door detailing, the carved columns and topiaries bring a taste of Old World styling. 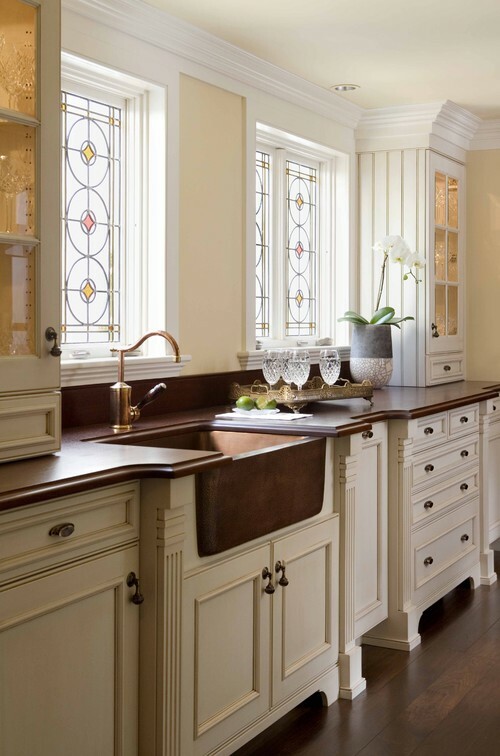 Soft ivory and stained glass are perfect complements to the warm glow of copper, pictured in this space created by Venegas & Company in collaboration with Foley Fiore Architecture in Cambridge, MA. This light, bright, old world style kitchen by Glen Alspaugh Kitchens & Baths, based in St. Louis, features two sinks—a Farmhouse Duet double basin as well as the Fiesta prep sink in an ingenious corner installation – simply stunning. 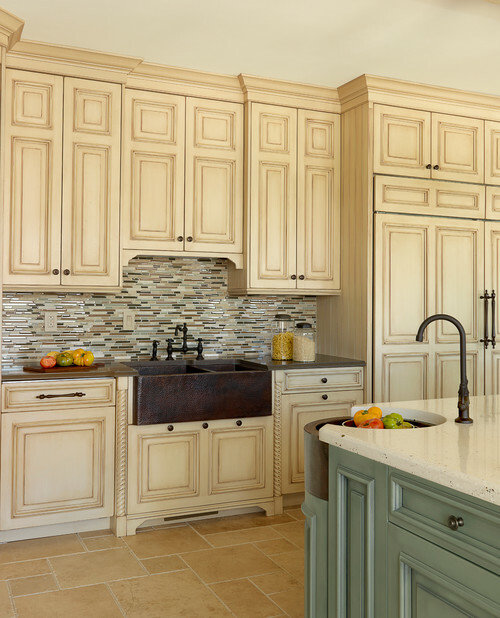 More design work by Glen Alspaugh Kitchens & Baths: this kitchen combines custom cabinets, elaborate stone walls, and the warm tones of the artisan-crafted Farmhouse 33 to create a charming and relaxing space. 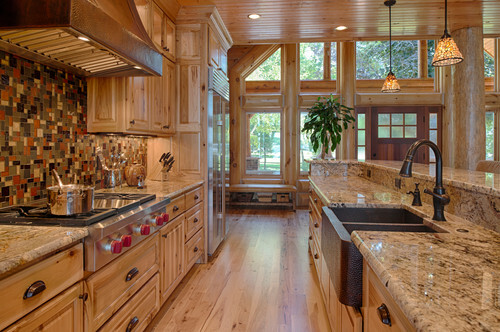 Natural wood cabinets serve as a fine backdrop. 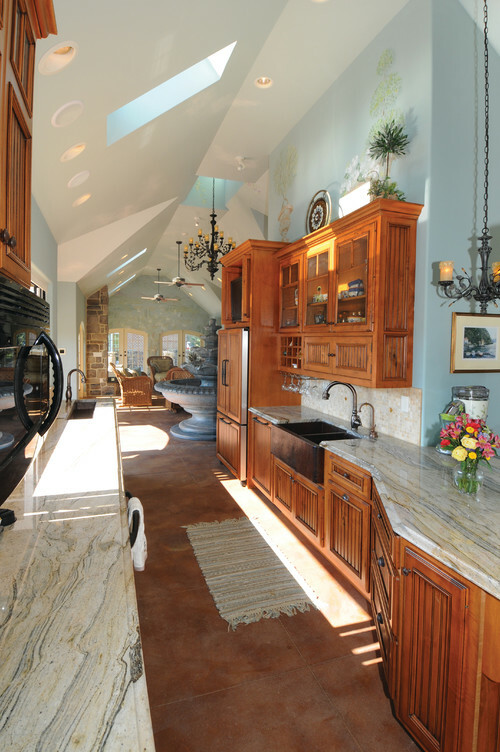 This kitchen, the work of Custer Design Group in Harrisburg, PA, is located in a cabana house, where fresh-from-the-sun pool guests can make themselves comfortable. You may also spy the Rio Grande prep sink, installed on the countertop opposite our Farmhouse Duet. Another stunning example of the uber-hip rustic design, Destree Design Architects’ impeccable detailing, including the use of the Farmhouse Duet and a custom copper range hood, gives this Wisconsin kit log home a classic, refined style. 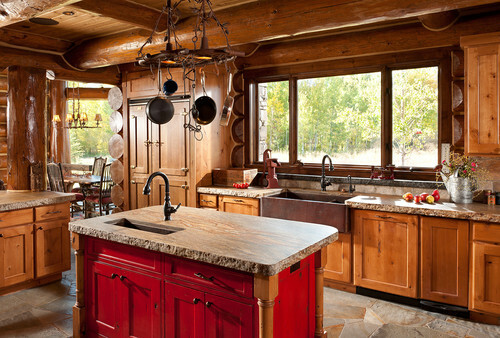 Rustic Kitchen by Madison Architects & Building Designers Destree Design Architects, Inc. 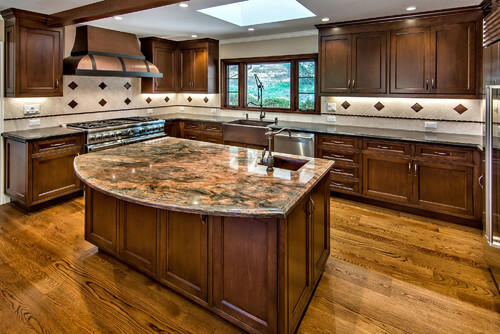 This open kitchen in Los Gatos, CA, combines stainless steel appliances with a copper range hood and farmhouse sink. The Cantina prep sink also makes an appearance in this kitchen, designed by Wm. H. Fry Construction Company. Traditional Kitchen by San Francisco General Contractors Bill Fry Construction – Wm. H. Fry Const. Co. This kitchen by Portland, OR, building and remodeling pros Olson Design Build reaffirms our belief that “luxury” and “rustic” can be used together in the same sentence. 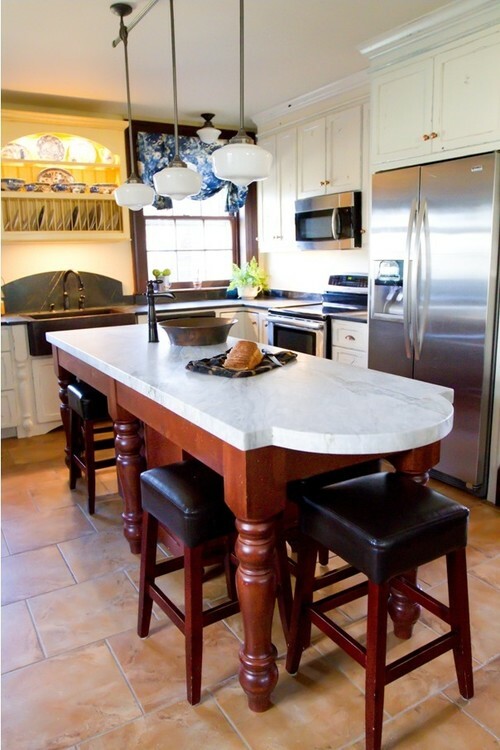 The 40″ Farmhouse Duet Pro gets an extra hand here from the Rio Chico on the kitchen island. The kitchen sink plated in brushed nickel takes center stage in this glitzy bar space. 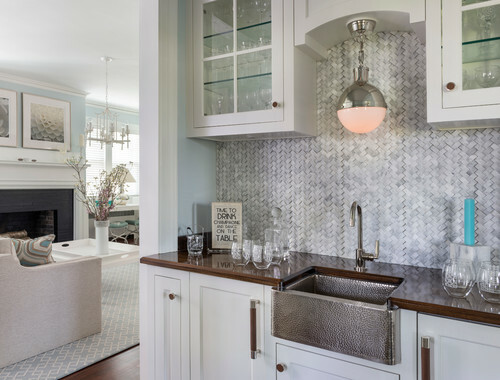 A Carrara marble tile backsplash and a chic light fixture provide a canvas for this 25” hammered nickel apron sink to shine. The history of this 19th-century home, designed by Merry Powell, is highlighted perfectly by a farmhouse sink, which has a long history itself. Note the unique placement of the Maestro Bajo vessel sink on the island. See how to get farmhouse style in your kitchen and learn more about the history of the farmhouse sink.